The cold season is here and everyone knows that it can be quite uncomfortable to have a room that does get proper heat. Home heating systems cost a lot to fix and if it is not done in the summer, when the cold weather arrives it becomes even more difficult. During the winter, energy bills go up and not everyone is prepared to make an investment in their heating system. Also, very few people check the heating system during the summer to see that it works properly. At the same time, some rooms simply do not heat properly due to other factors. The cheaper solution is to just get a room heater. It does not have to be big but it has to just work properly. A well-placed room heater can solve the issue with certain rooms not getting warm enough. Because they are mobile, they can be moved wherever they are needed. Surely, they will increase the energy bill but as a solution, they are the most practical option. There are several different types of heaters available and there are some differences between them. The most popular ones are the ceramic heaters. They have an electric heating element and a small fan to spread the hot air. Convector heaters work almost the same but circulate the heat better and thus they are a bit more energy efficient. Last but not least, there are oil heaters which are the most energy efficient but they are also a bit more dangerous because of their design. For our list, we will limit the options only to regular ceramic heaters and to convection heaters. With all these things said let’s jump right into our list of recommendations for the top 10 best room heaters in 2019. Honeywell is surely well-known and trusted the brand. 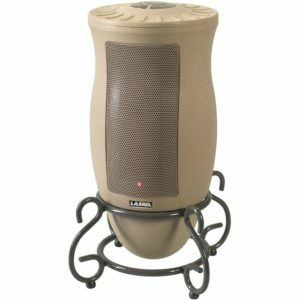 Their digital ceramic room heater is a good choice for the ones that are looking for a compact and inexpensive product. 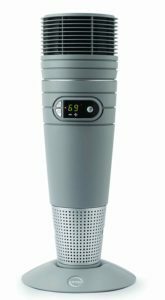 The heater offers 2 heat settings and comes with a timer that can be set for up to 8 hours. One bonus feature is the dust filter that captures the dust in the air before pushing hot air back. The model is available in 3 different sizes, has simple controls at the top and comes with overheat protection. The fan used for the heater does a very good at dissipating hot air. It can push enough air to heat up an entire room. The only problem is that it is too noisy. This happens because the fan used is quite small and has a high rotation speed. If the fan was a bit larger and did not spin as fast, it would have been much quieter. 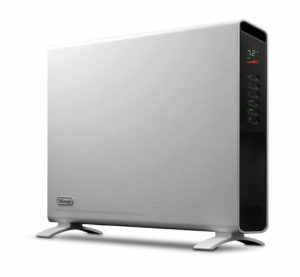 DeLonghi HCX9115E is a great product that can heat up even a large room. 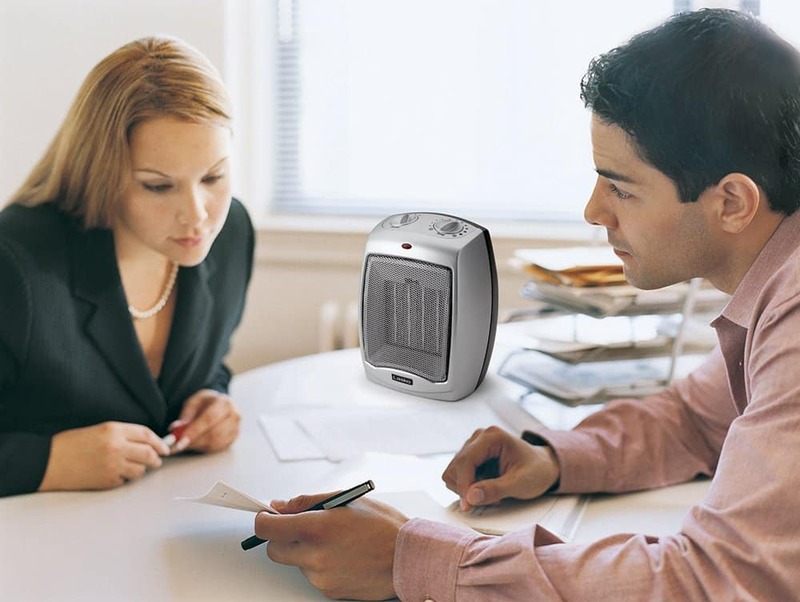 It is a convection heater which means it is energy efficient. The heater uses an adjustable thermostat to adjust the heat level and an LED display to show relevant information. DeLonghi also added an ECO function that can help save energy. Even if it is a 1500 watt heater, it does not add all that much to the power bill. Also, the heater can be mounted on a wall and it includes all the required hardware. The product presentation picture is a bit deceiving. It leads people to believe that the heater is smaller than it really is. In fact, the heater is quite large but has a rather slim profile. A lot of people will prefer to mount it onto a wall just to save room space. 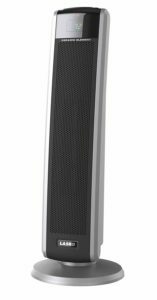 The Lasko 6462 ceramic heater offers great value for the money. It is an inexpensive heater that comes with a remote and a filtration system. In fact, the model uses a small mesh to trap dust which will need to be cleaned every 2 weeks. The model comes with an adjustable thermostat and can be set to rotate automatically. According to the specifications, the heater is a 1500 watt model, making it suitable for small to medium rooms. As for dimensions, the heater has a cylindrical shape and takes little floor space. The heater has a thermostat and can run at two heat settings. Usually, the low and high settings are quite apart in terms of the temperature range. This is not the case with the Lasko. In fact, there is not much of a difference between high and low heat setting. The low setting just makes the heater stop distributing power to the heating coil a bit more often. 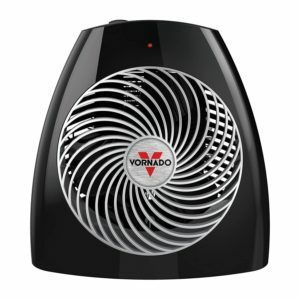 Vornado MVH room heater is the perfect solution for the ones that do not have a lot of floor space. In fact, it is small enough that it can even be placed on a desk or any other piece of furniture. The model has a rated power of 1500 watts and 3 heat settings. It uses a large fan to distribute heat and comes with a 5-year limited warranty. Last but not least, the heater comes with overheat protection. The fan spins at a relatively decent speed to not make it noisy. It is very quiet but this cripples its ability to push the heat and properly heat up the room. For its size, it will be able to heat up a small room but it will struggle when it comes to larger rooms. 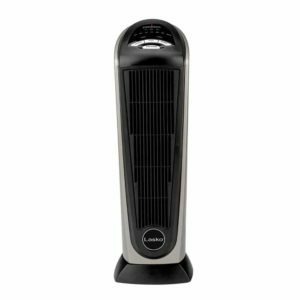 Lasko 754200 room heater was made to be portable and take very little storage space. This inexpensive model is perfect for a small room. It comes with 2 heat settings, 900 and 1500 watts and a built-in silent fan. The model features automatic overheat protection and comes with a small carry handle. An additional option has been added that allows the heater to run with just the fan without warming up. The heater is not as energy efficient as some of the other models on our list. For a heater that can warm up a small room, it will surely add a bit to the energy bill. The most efficient way to use it is to oscillate between the high and the low setting. However, the energy bill increase will be higher but not by much when compared to other 1500 watt heaters. 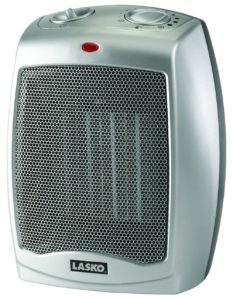 Lasko 5586 digital ceramic heater is a good choice for the ones that need to warm up a small to medium room. It is a simple 1500 watt tower heater with a ceramic element and a heating coil. The thermostat can be programmed with a timer of up to 8 hours while the digital display shows the current temperature and heat setting. The model uses a fan to spread heat and comes with a convenient remote. Last but not least, the heater is very compact and takes almost no floor space. Everyone knows how anything that is made out of plastic smells in the beginning. The heater does have a decent amount of elements made out of plastic and for the first days of use, it will spread a smell of hot plastic. It will go away but it can be annoying for the first few days. 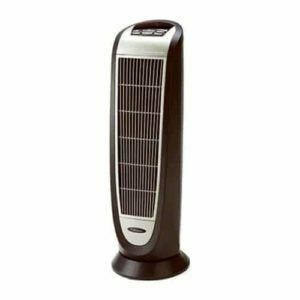 Lasko 5160 ceramic tower heater is a good solution for the ones that do not have a lot of floor space. It is a compact heater with a widespread oscillation and adjustable heat settings. It can go up to 1500 watts while the built-in fan will evenly distribute the heat throughout the room. The model has a small remote control but also, all the needed controls placed at the top of the unit. For safety reasons, the heater has been equipped with automatic overheating protection. The thermostat used for the heater is not very accurate. It is a bit off as it tends to go a few degrees higher than the temperature that has been set by the user. Some customers reported that the opposite can happen as well. Knowing how off the thermostat is will make it a bit easier to go on this small issue. Lasko 6435 room heater is one of the few models that manages to combine a stylish design with a practical solution for rooms that do not get enough heat. It is a simple ceramic heater with oscillation for better coverage and a remote to make it easier to use. 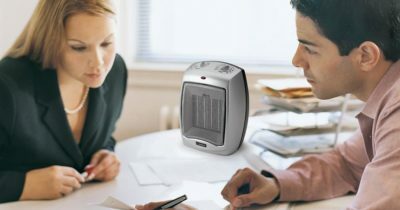 The heater has a maximum power of 1500 watts and an adjustable thermostat. For the design, the model looks like a large vase with a metal stand. As for practicality, the heater does not take a lot of space and has a quiet comfortable setting. Since the heater is made mostly out of plastic, the heating element will cause it to release a rather unpleasant smell. It will start smelling like melting plastic. However, no element inside the heater will melt. The smell will go away after a few days of usage. 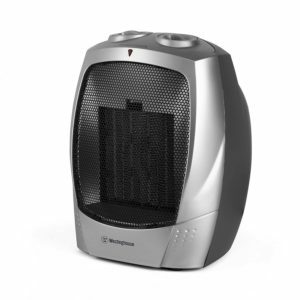 Westinghouse ceramic heater is a compact model that will prove to be very convenient when it comes to portability. It is very easy to move around and even comes with a small hidden handle. The heater has a maximum power of 1500 watts, 2 heat settings, and 1 fan-only mode. What recommends it the most, is the compact form factor. It will prove to be using the most in a small room. The heater is also quiet and very easy to use. The unit comes with a sensor that prevents it from overheating. There has been a small number of reports that the heater does not work properly due to that sensor. A solution is to tuck away the sensor or try to return the unit. Fortunately, this issue appears only for a very small number of units. Lasko 751320 is one of the best room heaters that one could buy. It has a very simple tower design and comes with a moderate price tag. The unit includes a remote but also has controls at the top of the heater. In terms of power, the Lasko is a 1500 watt model. It has multiple heat settings and a 7-hour timer. For improved safety, the heater also has overheating protection and a self-regulating ceramic element. Last but not least, the model has a very compact design and takes very little floor space. For its power and size, most people would assume that the heater can handle a medium size room. Sadly, the fan is not powerful enough to push more hot air. The oscillation feature helps but it is still only good enough to heat up a small room. Noise: Noise can be important to certain people. Others might not mind at all just how loud the fan in the heater really is. To draw a line, even the loudest model is still decent enough. Remote control: For some, this is a mandatory accessory. It is important to note that not all heaters actually include a remote. Some are simply made without one. If the remote is not necessary for a certain person, getting a heater without one should not be much of an issue. Power and heat settings: Almost all heaters use a thermostat and have different heat levels. Most of them have only 2 heat levels but there are some that have 3.